The efforts to get the Carnegie Public Library built, is as storied as the books inside. The Womens Mutual Benefit Club began raising funds for a library. Six years later, in 1904, a Library Association was formed. In 1910 a reading room was opened. 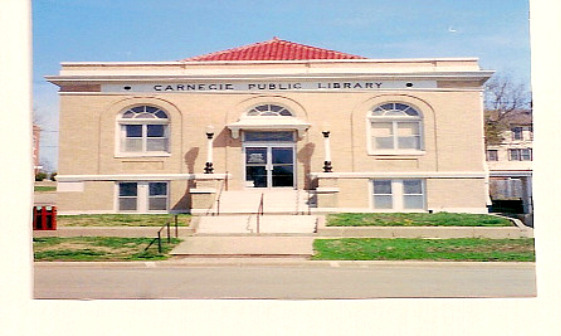 The mayor contacted the Carnegie Corporation to build a library, based upon the city raising 10% of the cost in taxes. The offer was rejected because the projected cost was too low. Finally in 1913, the city passed a resolution to raise $1,000 toward the cost, and this time the Carnegie Corporation agreed. Work was begun, and the Carnegie Public Library opened on New Years Day, 1916. It is still serving the public today, and is on the National Register of Historic Places. Hours: Mon. thru Thurs. 11:00 a.m. to 6:00 p.m.
Fri. and Sat. 9:00 a.m. to 3:00 p.m.